When it comes to relishing yummy lobster delicacies, Maine lobster dishes are second to none. More than half of the total lobsters caught throughout the world are sourced from Maine. Much of the fame of the Maine lobster is due to the fact that it is bigger in size, tender as well as the tastiest among all the lobster species. No wonder, they are on high demand by the food aficionados and come expensive on the pockets. A variety of lobster dishes is available in the celebrity restaurants throughout the globe. Regional influences have added taste and flavor to the original Maine lobster recipes. One such dish is Lobster Bisque. It is a delicious soup and a perfect dish for all occasions. As the name suggests, lobster is one of the ingredients to whip up this tasty soup. The fresher the lobsters, the tastier the soup becomes. For royal taste, you should go for the fresh Maine lobster. The succulent lobsters of Maine will make the soup more delectable. The other ingredients of Lobster Bisque include dry sherry, butter, flour, milk, bay leaves, pepper and salt. For enriched taste and enhanced flavor, you may use additional ingredients like fish stock, black peppercorns, carrots, chopped onions, oregano, ginger, tomato soup. Some use steak sauce during preparation to add an extra flavor to Lobster Bisque. Preparing this soup at home will not be a tough and time-consuming task for you. Moreover, rustling up something for your near and dear ones will also bring you much satisfaction. However, if you are too busy to make such a simple dish at home, online delivery is available for you. 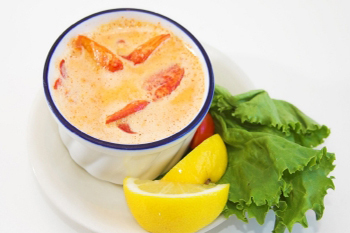 Canned Lobster Bisque is made of lobster meat, seasonings and dry sherry. So, you have to add milk and butter to the soup while cooking. Before purchasing canned Lobster Bisque, make sure to check if the dish includes Maine lobster or not. This is because, price of the dish greatly varies depending on the quality of lobster used. Love lobster! I have a terrific Lobster Bisque recipe if you would like it for your blog, just email me.